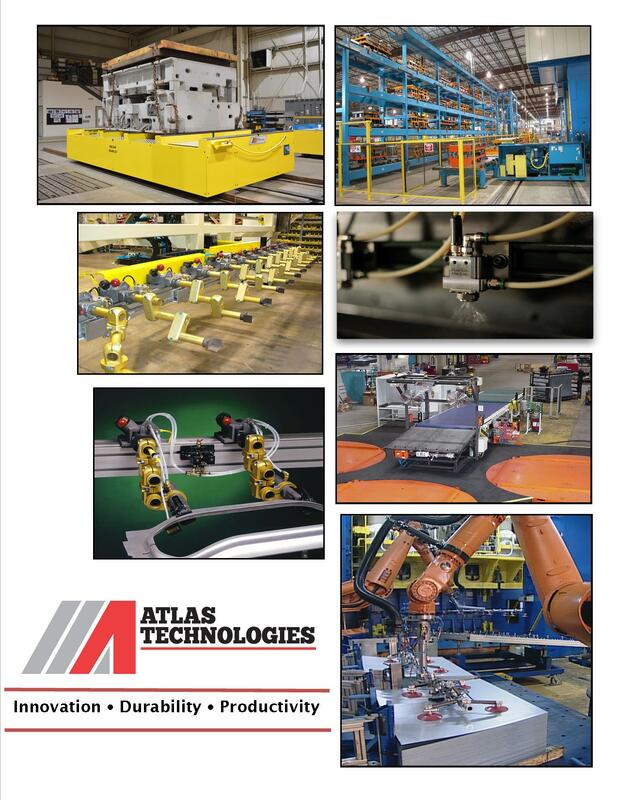 Atlas Press Transfer Systems are fully programmable, servo driven transfers that are easily retrofit to existing press installations, or can be integrated for new press construction. The Atlas servo drive design yields high speed production, and reliable part control. Our Atlas FLEX Finger Tooling components allow the customer the ability to work with one provider for both press transfer and tooling requirements. The small cross sectional size of the FLEX 1000 In-Press Transfer System is advantageous because it allows our customers to run the rails into exceptionally tight areas, like the heels of the die. This design also permits earlier entry and exit into the die when the window is opening or closing, giving additional die timing windows to work in and the capability of running at faster speeds. The FLEX 1000 is capable of transferring up to 300 pounds of parts and tooling, and features a transfer stroke of 0–36”. The FLEX 1000 Transfer System has eight standard die stations, but may be equipped with more in certain applications. The FLEX 1000’s overhead mount design allows easy access to the dies. The Bolster is left open for scrap removal and the windows of the press are clear for part feeding equipment. The transfer rails are supported along the length of the rail rather than the ends, giving the FLEX more rigidity and less deflection than our competitors. As with all FLEX Transfer Systems, jog capability, both forward and reverse, are independent of press actuation allowing for cycling without the risk of die interference. Atlas’ FLEX 1500 In-Press Transfer System is high speed and fully programmable. 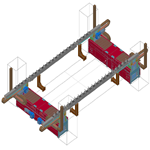 This design can be easily retrofitted to existing presses or integrated with a new press. The transfer path is fully programmable, and can run smaller parts faster than a cam actuated transfer resulting in a smoother transfer at faster speeds. . It is capable of transferring up to 450 pounds of parts and tooling, and features a transfer stroke of 0– 36”. The FLEX 1500’s overhead mount design allows easy access to the dies. The Bolster is left open for scrap removal and the windows of the press are clear for part feeding equipment. The transfer rails are supported along the length of the rail rather than the ends, giving the Flex more rigidity and less deflection than our competitors. As with all FLEX Transfer Systems, jog capability, both forward and reverse, are independent of press actuation allowing for cycling without the risk of die interference. The FLEX 3000 Tri-Axis In-Press Transfer System is designed with lighter loads in mind. The 3000 is equipped with independent electric servo drives for each motion of lift, clamp and transfer, the FLEX 3000 consists of two modular units. One located on the front of the press and the other located on the rear of the press. Atlas Press Transfers Systems provide the highest production rate capabilities on the market due to the patented design feature which puts the lowest inertia on the transfer axis. This low inertia design feature provides the capability to accel/decel the transfer axis faster, and since the transfer axis is a much longer stroke distance than the clamp and lift axis, the accel/decel of the transfer axis is what provides the highest production rates available. The FLEX 6000 “Through the Window Transfer” is the newest member of our successful servo transfer system applications. The FLEX 6000 Transfer System was developed to handle the largest and toughest high speed applications utilizing four independent transfer modules. It is capable of transferring up to 1,500 pounds of parts and tooling with a transfer stroke of 0-72”. Each module is equipped with its own train and servo motors giving the transfer system multiple axis of programmable adjustment and virtually unlimited flexibility. The FLEX 6000 Transfer System unique design provides easy access to dies. The transfer bar is built in three sections. 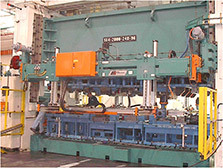 The two end sections separate and retract simultaneously from the center bar while the center bar locks into position on the bolster mounted support posts. This unique Atlas feature benefits the customer by not only providing accurate transfer bar positioning, but also by ensuring security to the equipment and its operators during movement. "“BAE is extremely satisfied with our Atlas Technologies Transfer Systems and Finger Tooling Technology. The Atlas Universal Tooling Rail design provides faster die changeover than others on the market. 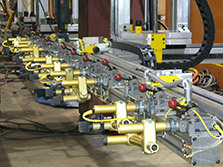 The ability to only change the transfer fingers verses removing the entire rail is beneficial to our production times. Atlas is also very accommodating should our […]"
"Your company has done a great job for Wellington your transfer system works great!!! My guys are very happy with your service department and the best word to describe your transfer system is (It works day in and day out)." "We’ve recently started up our fifth Atlas Flex transfer system. All of our Atlas equipment has performed exactly as designed and been very reliable. The equipment is well thought out and easy to maintain. The systems have been extremely easy for the operators, setup and maintenance personal to learn and use. I’ve also found Atlas […]"
"“We at Industrias Guidi, found Atlas Technologies to be a company with an open minded staff, with a vast array of experience and know-how in which we could rely. Not only on the complete upgrade and refurbishment of our Flex 5000, but also in the development and construction from the ground up, of a new […]"